The integrated lid lock keeps the lid secure so you can easily transport it wherever you please. The aluminum legs and stabilizing feet do an excellent job at keep the grill in the same place throughout the entirety of your cooking session. The sturdy legs connected to this grill will allow you to grill on surfaces that aren’t as stable. The legs will keep the grill balanced as you cook your favorite foods. The grate is made with porcelain, so you can easily clean it up when you’re done cooking. Most of the time, you’ll likely find food particles or seasoning sauce on the grate; substances that can easily be cleaned with a wet cloth. Next is the Smoke Hollow 205. This stainless steel grill was designed to last a long time, while cooking your food to the perfect temperature. 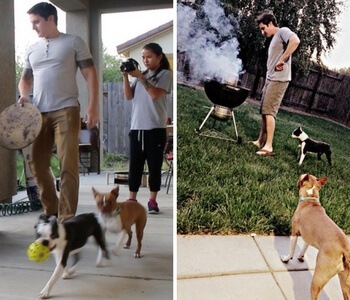 This grill is easily portable thanks to the folding legs on the bottom. All you’ll have to do is flip them open and shut them closed in one motion. 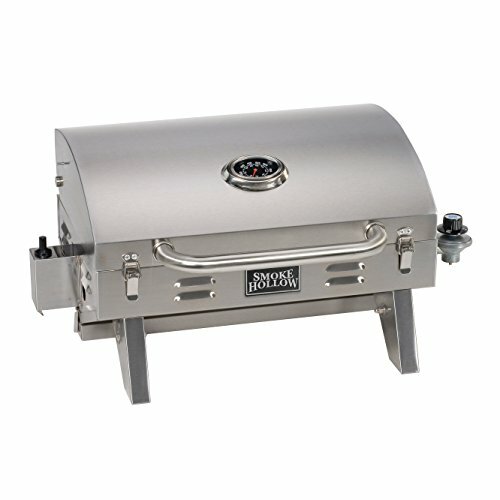 There are also two stainless steel locks that connect the lid to the base of the grill. This means you can move the grill right after cooking, without having to worry about any ashes falling out. When you’re ready to begin cooking, you can connect a small propane cylinder to the right side of the grill before getting started. The temperature gauge will be right at eye level so you can monitor how hot the grill is before throwing on some food. The 305-square inches of cooking room will be a perfect size for a large group of people. It can easily cook eight burgers at once! The “U” burner emits about 10,000-BTU's, so you’ll be able to easily cook your food as quickly as possible. Since the grill is made with stainless steel material, it is unlikely that it will obtain rust and other types of damage. Current buyers have claimed that while the lid doesn’t necessarily rust, certain parts of the grill have been known to break down, so use proper care to extend its service life. Another basic portable propane grill, the Char-Broil gas grill will help you feed everyone, no matter where you are. The metal legs can fold over the lid; locking it in place. From there, you can use heat resistant handles (one on each side) to pick the grill up and move it, without having to wait for it to cool down. The outlet for the propane tank is right next to the grill for easy access. You can use either a 14.1-ounce or 16.4-ounce propane cylinder; two sizes that are expected to last a long time. The 11,000-BTU burner will make sure the food cooks evenly and on time, no matter how many people are with you. This grill might look simplistic, but it does its job very well and will last you a long time. This portable gas grill from Char-Broil has a steel construction that applied with a high-temperature finish that is meant to deter rust from accumulating. No matter where you go or what the weather is, this portable gas grill should meet your needs. The Coleman Fold-N-Go grill takes “portable” to the next level. Being the smallest grill on this list, the Fold-N-Go can fit anywhere with ease. This grill is so small you will be able to fit it in a cabinet or drawer in your kitchen. The cooking surface is measured at 9 inches by 11-inches, which isn’t much, but won’t be a big deal if used for one to three people. Something to look forward to is the cooking speed. This small grill gets hot fast, so make sure to pay attention when using it. 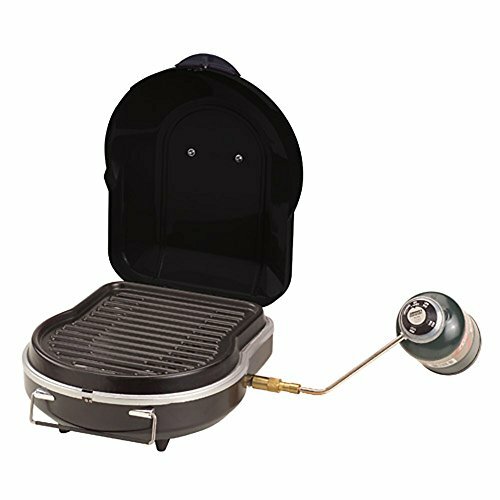 While some portable propane grills use a button ignition, this grill can be started up with a long lighter. Attached to the grill is an outlet to connect the propane tank. Depending on your needs and how much you can carry, you can use a small one pound propane canister or you can use the Coleman adapter to connect a larger propane tank. When looking at this grill, it’s strengths are pretty straight forward. No special features, no unique colors, but it gets the job done for a portable propane grill. Which Portable Propane Grill Should You Buy? In a market saturated with gas-powered grills, it can be slightly difficult to determine the best option for you. If you need a grill for the beach, camping, tailgating, or for outside your RV, a portable propane grill will save you the time you need to enjoy your day. There are questions you need to ask yourself before purchasing a grill. Are you willing to assemble the grill? How often do you expect the use the grill? Will it be used for a large or small group? Where do you plan on storing it when it’s not being used? Do you want a long term grill or just something for the time being? And finally, how much are you willing to spend? The answers to these questions will ultimately determine which grill you should invest in. If you don’t like to assemble the grill, go with the Weber Q1200. This grill comes ready to go out of the box and comes in almost 15 different colors. This grill is also recommended for people who like college sports, since it is available in select college colors. It also has plenty of room, so if you usually grill for a large group of people, this grill will do wonders for you. The Char-Broil portable grill or the Coleman Fold-N-Go are two options that get the job done. They don’t have any “bells and whistles”, but they cook food at a reasonable pace and are small in size so you can carry and store them without any issues. Remember, time is valuable, especially when you’re on the move. The good thing about portable propane grills is that they are typically easy to start and made small so that they can fit basically anywhere. 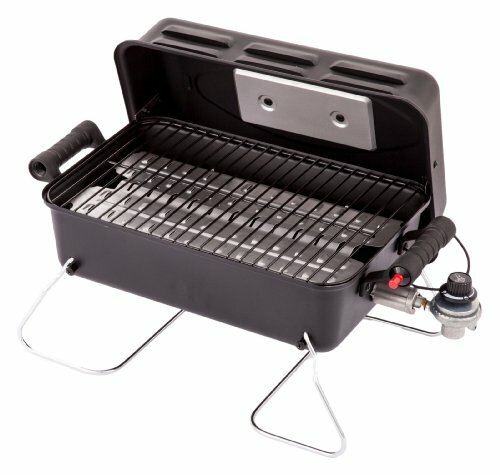 A portable propane grill is great for someone that is going on a hike, going on a camping trip, sitting outside the RV, or just out on their apartment balcony trying to enjoy the weather. What are the benefits of having a portable propane grill? In comparison to charcoal, propane lasts a lot longer. Instead of buying a big bag of briquettes, people usually buy small propane cylinders for their grills. These cylinders are fairly light, yet they will last you a few rounds of cooking before tapping out. The long lasting propane will likely save you money, since you won’t need to purchase charcoal bags almost every other time that you decide to grill. Charcoal and wood heat is sometimes inconsistent. You have no guarantee that the flame will stay lit throughout the duration of your cooking time. Propane gas on the other hand will make sure that you get the constant heat you need to cook your food the right way. You won’t need to constantly re-light the grill because there is a little wind. Instead of waiting for coals to get grey, you will be able to charge up the grill within minutes. Portable propane grills use British Thermal Unit (otherwise known as BTU) to measure how much heat it emits, so you will be fully aware of how capable the grill will be prior to buying. When it comes to these grills, the higher the BTU, the hotter the grill will be. Taste will also be different when it comes to charcoal versus gas. If your propane tank omits too much gas, you will soon notice a gas-like taste in your food; a bad experience. If you recognize and hate that flavor, you'll want to check out a portable infrared grill. Gas grills start up quicker. Charcoal enthusiasts would argue that gas grills don’t nearly reach the potential temperature that charcoal grills would. In addition, those who like that smoked, char flavor to their food would prefer a charcoal-powered grill over something with gas. Propane grills are also very easy to clean compared to grills that use other cooking methods. When it comes to charcoal grills, you have to remove the ash, burned food, and any other annoying substance, but with propane grills, wiping off of the grates with a wet cloth will suffice. These grills will save you a surplus of time that can be better spent out on the boat, campsite, or backyard. There are so many options when it comes to portable propane grills. Finding the best one comes down to what you your grilling preferences are.